I’m excited to finally show you some of the renovations I started in our home in France before our Summer holidays. As some of you know, our holidays home became our main residence when we relocated to the beach in France after twenty-three years in London. When we bought the house about twelve years ago, it was really in a sorry state. Yet, both of us could see the potential of the house which had a good layout and came with a 2175 m2 private garden. For Steve, who grew up on a farm in New-Zealand with a lot of space, the garden was everything. To this day, the outdoor space we have is one of the things I appreciate the most (that and living close to the beach!). As the hallway runs through the house and gets a beautiful natural light from the adjacent 4 bedrooms and the laundry, I wanted to keep this wonderful Summer vibes with white walls and add a few natural accents which would remind us of the beach. To help me put down my vision on paper, I created the mood board below which includes more natural touches with wooden storage and wicker pendant lights. 12 years ago, we painted the textured walls water and lime powder. A messy job but great if you renovate on a tight budget. Going from one white space to another white space doesn’t seem like a major change. However, we did several things that really modernised the space while making it a lot brighter. Initially, we were supposed to move the door frame towards the wall because of the new kitchen. As soon as I saw how it was opening the space, I asked our Builder to leave it that way. Large doorways are something that I will do again. This has really changed the vibe of the room, making it look more spacious and open. Step 2: Plastering the walls to obtain a smooth, modern finish. These days, a lot of Plasterers are basically putting plasterboards up which is easier and faster. In a renovation project, plasterboards are fixed on top of the existing walls. They need to be fixed onto metal rails. This means it will reduce the size of your room. A messy job but worth doing. However, our Plasterer was fab and protected the floor well. Last year, I let myself convinced by the tradesman we hired to re-do the back room using normal paint. He assured me that a slightly wet sponge would be sufficient to wipe off any scuff marks. It wasn’t!! It left marks and made the wall look dirtier so I didn’t want to make the same mistake again. As we have a boisterous dog and I like my white walls to be easy-to-care-for, I was keen to use a washable paint similar to the Dulux Valentine one we used in our home in London a few years ago. The Dulux Valentine Easycare paint is 20 x tougher than the standard Dulux Valentine paint so you can remove stubborn marks without damaging the paint which was, what I was after. In addition, two coats were sufficient to cover our walls. In France, the same paint is called Dulux Valentine Colour Resist. I really like the smooth finish of the walls. Painted in pure white, it reminds of a simple Greek home in the summertime. When the sun flows in, our hallway looks even more summery. I stored my beautiful Cluster lights by Kathleen Hills in the garage for another renovation project and replaced them by these beautiful pendant lights from La Maison Pernoise. I also took out the vintage workbench that you can see on the front cover of my friend’s book “How the French live”. The idea is to replace it with 5 Ivar cabinets to store Mila’s skateboards & protective gear, our helmets, Lucas’ things (leash, collar, brushes, etc), Winter gloves & scarves. I’m still mad at IKEA for the major delay experienced during the kitchen renovations I will finalise this part soon. I hope you’ve enjoyed this. Let me know in a comment below or if you have any questions. 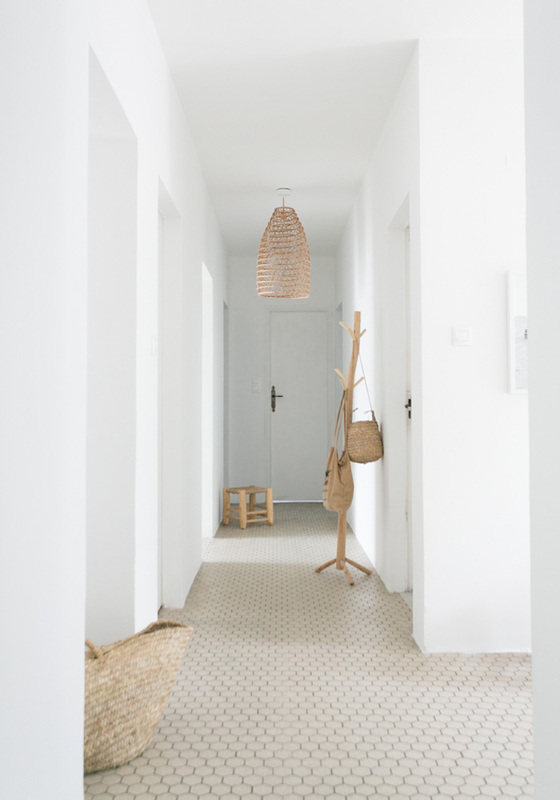 Should you be interested in more hallway ideas, check these 10 beautiful Scandinavian white and wood hallway solutions featured on My Scandinavia Home. Absolutely gorgeous, pared back easy living. Fabulous renovation & thank you for sharing. Is the Dulux Easycare Pure White paint available to purchase in the UK? & is the finish matt or satin, do you use Dulux Pure White eggshell for your doors & trims etc. Recently painted some rooms In F&B ‘all white’ modern emulsion which is meant to be wipeable for scuffs ….but isn’t! & also the eggshell in ‘all white’ is looking yellow after only 9months. Yes it is as it is sold under a different name in France (see blog post in French for the name). We used the matt finish which is nice but I think we used the satin when we renovated the house in London. I haven’t tackled the woodwork yet. I never tried F&B in white, I’ve always gone for Dulux because I love how their white is really pure white. Good luck with the DIY! I love what you did to this space. So light and airy. I’ve always used F&B but I want to try something different. Can I ask, did you use Pure White or White Mist? Thank you Karine. Have a great weekend!